JRPG Jungle: Reasons Playstation Plus is AWESOME!! When you wake up on a Thursday morning on the first week of every month and see five free games waiting for you, it's hard not to argue that Playstation Plus is the most amazing thing ever since oxygen. Throw in Cross-Buys for PS Vita partnered in with two of these games and I can't find many reasons to not recommend this service! But 4 months ago, I was as skeptical as most people are to any subscription service. I understand the pain of renewing a subscription and the fear your card being automatically charged when you needed that money for food. However, Playstation Plus has never been anything other than a really good value game subscription and I'll tell you as much as I can to help you make your decision. Yes. Oh sweet lord yes. Every month, games for PS3, PS4 and PS Vita get put on Playstation Plus for you to download for free until the end of your subscription. You basically add these games to you shopping cart (like I did in my photo) and they're yours once you finish the Checkout process. Also, Playstation Plus' game library has introduced me to some great PS4 games such as Resogun and Contrast! I would have shown interest in both these games but I would never have bought them with money. Resogun is one of my favourite PS4 games, so I am eternally grateful for my subscription! Also - GAME BANKING. I discovered this tip from the Beyond! podcast from IGN (available on iTunes or the IGN website). If you have the Playstation mobile app, you can select all of the games across PS3, PS4 and Vita for Playstation Plus, checkout with them and not download them yet, but keep them for downloading at anytime. This saves hard drive space and gets your most money's worth. 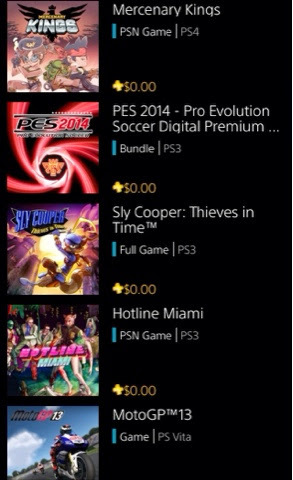 I would never play PES 2014, but I keep it in my downloads in case I ever have a friend around who would. And why the hell not, it's free in your subscription! Bear in mind - pretty sure you lose all these games once your subscription ends. I never let mine run out, but it's up to you. Just don't get too attached if you know you'll be canceling your subscription. Cloud saving is pretty neat. I'm glad to know my perfect Persona 4 Golden save is backed up on the cloud. Discounts at the Playstation Network store: these aren't always substantial discounts and it's not on everything, but not complaining! You can turn off automatic renewal and once that's off, you won't be charged for Playstation Plus once your subscription is over. It will just end if you don't renew it yourself and you'll be a regular PSN User again. You can subscribe to PSN for 1 month ($9.95), 3 months ($19.95) or 1 year ($69.95) at the moment. I do the three months as I don't normally have a spare $69.95 lying around by the time it's time to renew my subscription, but the one year is the best value. I would recommend using a free trial to see if you like this service or trying a 1 month. If you own a PS3, a PS Vita and a PS4 frankly I think it would be stupid not to take advantage of this service as there are really nothing but benefits!